Presidential candidate John Kasich delighted Medicaid expansion advocates and infuriated his fellow Republicans in 2013 when he warned expansion foes that failing to help poor people could deny them a place in heaven. 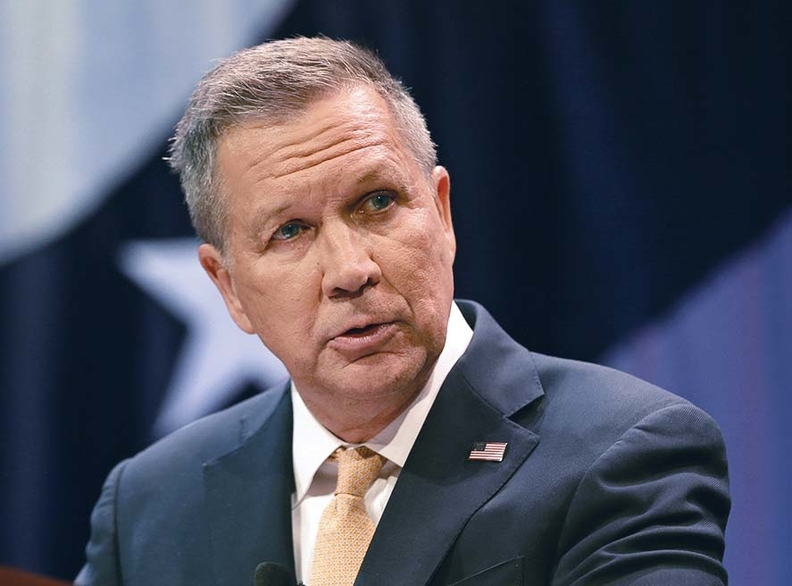 He aimed those comments at GOP critics of his decision to do an end-run around the state's Republican-controlled Legislature and expand Medicaid to Ohioans with incomes up to 138% of the federal poverty level as authorized by the Affordable Care Act. About 660,000 people have gained coverage under Kasich's expansion. Now some might say the Ohio governor is hurting his own chances with St. Peter with his administration's bid to require 1.4 million low-income Ohioans to pay modest premiums for Medicaid coverage, including people with incomes as low as 10% of the federal poverty level, or $1,188 a year. People who did not pay 2% of their income each month, up to $8.25, into a health savings account would be disenrolled until they make full payment. That would include people with incomes below the federal poverty level. While Kasich originally wanted to require only people with incomes from 100% to 138% of poverty pay premiums, Republican lawmakers extended that to people under 100% as well. The Kasich administration projects that in 2018, when the new program would start, about 126,000 people, or 9% of the 1.4 million affected beneficiaries—including women being treated for breast and cervical cancer, teens coming out of foster care, and non-disabled adults who gained coverage due to eligibility expansion under the Affordable Care Act—would lose coverage due to the costs. The full Section 1115 waiver proposal, dubbed Healthy Ohio, will be unveiled April 15, and it will go through public hearings and comment periods. Like similar Medicaid waiver programs and proposals in Arkansas, Indiana, Kentucky, New Hampshire, and Michigan, the program would give beneficiaries financial incentives to engage in healthy behaviors and refer them to job training and employment opportunities. The Kasich administration projects that the program would save the state about $182 million over five years. The waiver would have to be approved by the CMS, which has not okayed any state waiver proposals that disenroll beneficiaries with incomes below the poverty level for failure to pay premiums. But the waiver request, which was mandated by the Ohio Legislature, does not make continuation of the state's expanded Medicaid program dependent on federal approval of the new model. The Kasich administration repeatedly cautioned lawmakers before they approved the waiver model that the CMS was unlikely to allow dropping beneficiaries below the poverty level for non-payment, but that didn't stop them. The Kasich administration argues that the Healthy Ohio program “will introduce enrollees to a consumer-directed healthcare model in which members will be incentivized to utilize the healthcare delivery system in a cost-conscious manner.” It says the program will promote “member engagement in health and personal responsibility,” increase use of preventive services, and encourage members to seek employment and private health coverage. But John Corlett, president of the Center for Community Solutions in Cleveland, a nonpartisan think tank, said the proposed program would disrupt the state's successful Medicaid expansion, and might well lead to more people losing coverage than the state projects. His center's analysis of the waiver proposal cited significant enrollment declines in Oregon, Wisconsin, and Virginia after those states imposed cost-sharing on Medicaid beneficiaries. It also noted that Arkansas canceled plans last year to require cost-sharing for beneficiaries below the poverty level, at least partly due to the administrative costs involved. The Ohio Hospital Association raised the same issues in its report on the waiver proposal last October. It said most hospitals currently don't collect Medicaid copays because it's not cost-effective. It also said health savings accounts would be confusing to Medicaid beneficiaries and that helping them with the new system would put a heavy burden on hospitals' financial services staff. The hospital association also asked how its members should adjust their charity care policies if Medicaid beneficiaries lose coverage. “Converting almost 1.1 million people… to the Healthy Ohio program will present significant challenges to the covered population and the providers who serve them,” the report said, predicting coverage disruptions and unpaid claims.